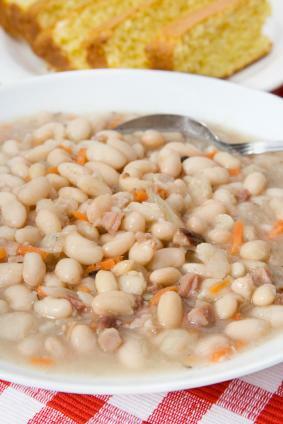 Good ham and bean soup can be an economical use of leftover ham or a tasty way to utilize ham hocks. If you happen to have a can of beans handy that you would like to use for your ham and bean soup, then by all means go for it. The typical bean used in ham and bean soup is the great northern bean or navy bean. Both of these beans are small, white beans and their flavor matches well with ham. Pick over the beans. Spread the beans out on a cookie sheet and check for small stones. Remove any small stones and broken or discolored beans. Wash the beans. Rinse the beans under cool running water to remove any dust. Soak the beans overnight. While soaking the beans is not strictly necessary, it does reduce overall cooking time. Just place the beans in a bowl and cover with cool water. Quick soak method. Place the beans in a pot and cover with water. Bring to a boil for 2 minutes. Then cover tightly and remove from the heat. Let rest for one hour. Discard the water. Whether you use the long or quick soak method, you should drain the soaking water from the beans before using them in your soup. Once the beans are prepared, you can then use them in your soup. You might be wondering if it is absolutely necessary to soak beans before using them in your soup. The answer is no, you do not. Although soaking does reduce cooking time and it does give the beans a more consistent texture. I suggest using the quick soak method because it is effective and will get your beans ready for dinner tonight. But if have the time to use the overnight soak method, you will find that the beans, once in the soup, will be fully cooked sooner. Prepare the beans as described above. I suggest using the quick soak method. In a stockpot or a large pot, heat the oil over a medium flame. Add the garlic, onions, carrots, and celery. Reduce the flame to medium low and slowly cook the vegetables until the onions are translucent, stirring occasionally. Add the vegetable or chicken stock and the ham bone or ham hock and the diced ham. Add the beans to the soup. If you are using a ham hock, remove it from the soup and remove the meat from the bone. Add the meat from the bone to the soup. Test the beans for doneness by tasting some of them. They should be very soft to the tooth.